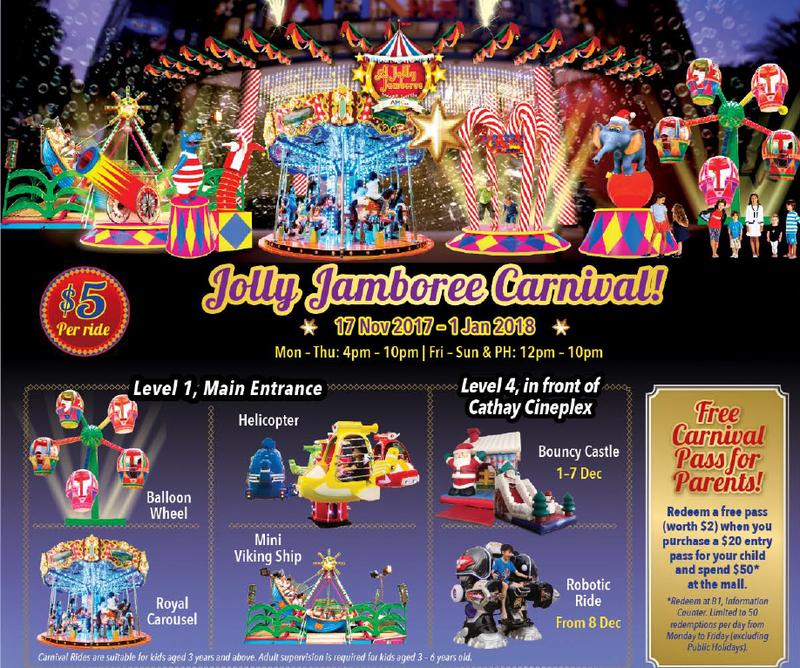 Have a Jolly Jamboree with the kids at AMK Hub this Christmas! It's December and the sweet scent of Christmas is wafting through the air! But one doesn't have to brave the insane elbow-to-elbow human traffic along Orchard Road to ring in the festive season. The same dose of jolliness can be found in heartland malls too! And from now till 1st January, AMK Hub has pulled out all the stops to bring the Jolly Jamboree to the heartlands. Experience Christmas at AMK Hub like never before, by soaking in the festive sights and sounds of a carnival! The mall's main entrance has been transformed into the biggest Christmas carnival party in the heartlands with thematic carnival rides, snow and bubble shows, and unique decorations of circus animals. Oh, did someone mention carnival rides? That definitely got the monkies all pumped up! Located at Level 1 Main Entrance of AMK Hub, families can step into a Christmas Wonderland featuring a line-up of theme park rides suitable for the kids! A perennial favourite of kids, the Royal Carousel is a staple of all Christmas carnivals and still remains a must-sit ride for Ale the princess. And of course, a princess has to have her 2 bodyguards, no? LOL. If your kid is a fan of the Ferris Wheel, then a miniature version in the form of the Balloon Wheel will thrill him or her. For younger kids who are not tall enough for most rides, the Helicopter Ride will be their best bet. For the boys though, the Viking Ship appeared as the most thrilling ride of the carnival! And trust Ale to ALWAYS ham it up for the camera... even on a swinging Viking Ship. Heh. Each of the above costs $5 per ride. Passes are sold onsite at the carnival ticket booth and each pass entitles you to enjoy all the rides within the day of purchase. And parents can go on the rides with their kids for free too! Simply spend $50 in at AMK Hub to redeem a free pass (worth $2) with the purchase of a $20 entry pass and you can accompany your child to have fun at the Carnival Rides! In addition, $2 will be donated to NTUC-U Care Fund with every $20 Uncle Ringo Pass purchased. *Limited to the first 50 redemptions per day, from Monday to Friday (excluding Public Holidays). Besides the carnival rides, get all shutter-happy with the camera with the sights of a circus display consisting of a life-size balancing elephant, an interactive candy cane cluster and more! Want more carnival fun? Head up to the Level 4 event area where children above 3 years old can have a bouncin’ good time in the Christmas Bouncy Castle (at $5 per entry, now to 7 Dec), or take an exciting spin on the Robotic Ride (at $10 per ride, from 8 Dec). The rides are open daily: Mondays to Thursdays 4pm – 10pm and Fridays to Sundays (including Public Holidays) 12pm – 10pm. Now, here's a chance to pretend that you are far away from Singapore’s searing heat... by enjoying a snow and bubbles show right outside AMK Hub’s main entrance! Happening from Mondays to Thursdays at 8pm, and Fridays to Sundays (including Public Holidays) at 6pm and 8pm. 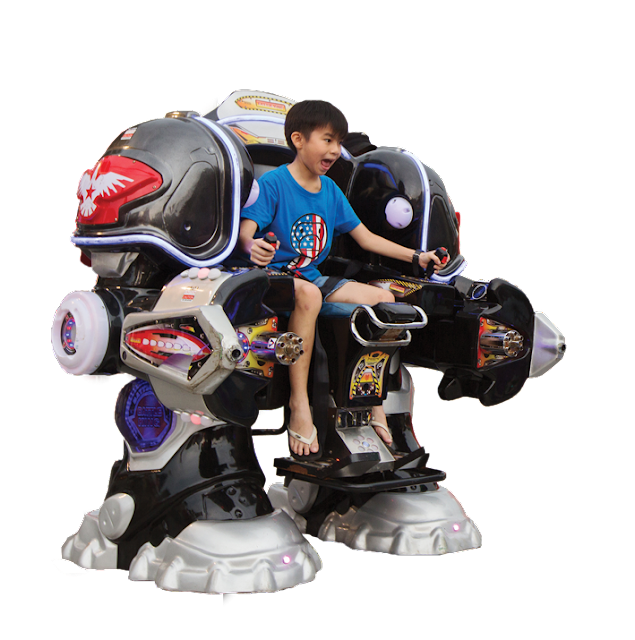 Experience the fun-filled snow and bubble shows at AMK Hub’s spectacular winter wonderland showcase. Because honestly, which kid doesn't adore snow and bubbles??? Okay, so the snow is not exactly real snow. But try telling that to the kids, who were having a whale of a time all the same. If you are doing your Christmas shopping at AMK Hub, be sure to keep a lookout for the Christmas troop as they take a trip around the mall for photo opportunities! Every Saturday and Sunday at 2pm and 7.30pm, Santa and friends will be making an appearance within the mall so do not miss the chance for a photograph with the iconic characters of Christmas. For the monkies, meeting Gingy was definitely the highlight after our dinner at AMK Hub! 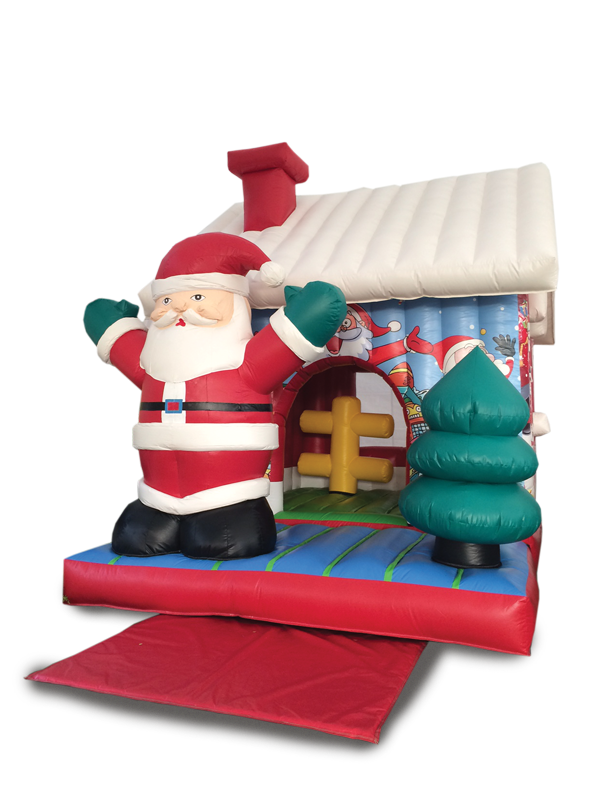 Looking for that special Christmas decor to beautify your home and office, or the perfect gift for your family, friends or colleagues? The Christmas Marketplace at Basement 1 Exhibition Hall is your best shopping stopover! Discover the world of festive ornaments that would bring little sparkles to your Christmas party and gifts your loved ones would adore. Snow and bubble shows - check. Meet & Greet - check. There is certainly something for everyone at AMK Hub this festive season! So the next time you are in Ang Mo Kio or around the area, pop by AMK Hub for a day of fun activities for kids and parents - it will be a Jolly Jamboree! Thanks to AMK Hub & Uncle Ringo, I have TEN Carnival Passes to give away! Each pass is worth $20 and is good for 4 rides. 1. LIKE AMK Hub's Facebook page HERE. 2. Leave a comment in the corresponding Facebook post HERE or in this blog post after you have done so. Giveaway ends on 10 Dec 2017, 2359 hours. For more information, visit AMK Hub's website and stay updated with all the promotions on its Facebook page HERE. Liked and shared! Thank you for organising this and would love to bring my boys for the rides! Done. Like n share.. Merry Christmas..
Nice holiday activities for my sons. Liked and shared.. Good to see such beautiful christmas setup and events for the kids. Looking forward to bring my kid there..
hope to win this for my boy! super like and shared! Blessed Christmas to all and thank you for the giveaway! Liked! Hope to enjoy this Christmas festivity with AMK Hub!